Tim Hill has acted in over seventy-five stage productions, including classics by Shakespeare, Chekhov, Stoppard and Wilde (to name a few). He has also been paid good money to lick chocolate syrup off the floor in a TV commercial. It’s a living. Noted stage roles include Martin Luther in Luther, The Monster in Frankenstein, Lenin in Travesties, Merriman in The Importance of Being Earnest and Tom in The Time of Your Life. He’s performed with Artists Repertory Theatre, Shaking the Tree, Northwest Classical, New Rose, Triangle! Productions, Lakewood, The Musical Company, Portland Actors Ensemble and many others. 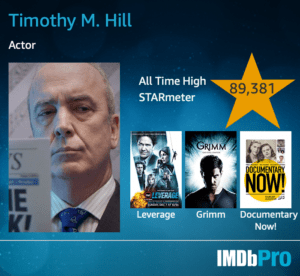 On camera Tim has had co-starring roles on Grimm (NBC) and Leverage (TNT), and has appeared in numerous national and regional TV commercials and industrial projects. He also provides voiceover work for clients all over the world. He holds a BA in Theatre Arts from the University of Oregon (go Ducks! ).